Imaginative and attractive, cutting edge in its conception, this text explicates a model for the integration of language arts and literacy education based on the notion of framing. The act of framing – not frames in themselves – provides a creative and critical approach to English as a subject. 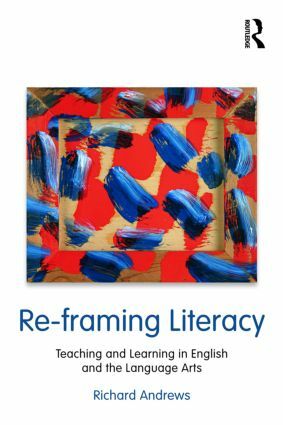 Re-framing Literacy breaks new ground in the language arts/literacy field, integrating arts-based and sociologically based conceptions of the subject. The theory of rhetoric the book describes and which provides its overarching theory is dialogic, political, and liberating. Pedagogically, the text works inductively, from examples up toward theory: starting with visuals and moving back and forth between text and image; exploring multimodality; and engaging in the transformations of text and image that are at the heart of learning in English and the language arts. Structured like a teaching course, it is designed to excite and involve readers and lead them toward high-level and useful theory in the field. Offering an authoritative, clear guide to a complex field, it is widely appropriate for pre-service and in-service courses globally in English and language arts education. 1. What’s in a frame? Richard Andrews is Professor in English at the Institute of Education, University of London.